Are you having a hard time finding an online store that offers legitimate nootropic products without any risk of being taken for a ride? Then you may want to take a look at Nootropics.com, which carries various nootropic products in capsule form so you don't have to do the measuring and mixing. They offer shipping to any point on the globe (except for countries with substance importing restrictions, of course), with a secure connection within their website for payment processing. There are a few drawbacks though, such as the limited payment options and their refund policy for seized goods. Still, Nootropics.com is worth checking out. Secure Shopping: Nootropics.com offers HTTPS, which means all connections to their website are private and secured with a trusted server certificate. Moreover, their payment processor has Level 1 PCI certification - the industry standard when it comes to accepting online payments via credit cards. 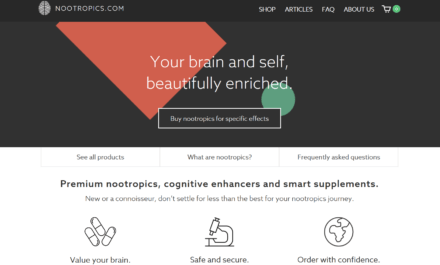 Effective Filtering Tool: If you are looking for a nootropic product with a specific effect, then you'd be delighted at Nootropics.com' product page. It makes use of a filtering tool based on the different effects of the product on the user; all you have to do is click and select. International Shipping: Aside for a few exceptions, Nootropics.com accepts orders from any point of the globe. They have a list of countries, which you can check in their FAQ page, where they do not ship orders mainly due to customs issues. Refunds For Seized Goods: Like other nootropics suppliers, Nootropics.com does not accept a refund request if your product is seized at your local customs department. They do, however, review each case and see if there is something they can do to help. Limited Payment Options: As of the moment, Nootropics.com only accepts payment via Mastercard and Visa. They have stated that Bitcoin and more payment options will be available soon, so it seems that they are working on this limitation. Nootropics.com offers a variety of products, namely: Adranafil, Aniracetam, Citicoline, L-Theanine, Melatonin, Noopept, Phenibut, Phenylpiracetam, Piracetam, and Tianeptine. Prices range from $19 to $59 a bottle. You can make use of their filtering tool to show only those with a specific intended effect like anti-anxiety, cognition, confidence, energy, fitness, focus, memory, mood enhancement, motivation, neuroprotection, relaxation, sleep quality, socializing, verbal fluidity, and vitality. This makes it a lot easier to search for nootropics that can serve your specific need. All of their products are in capsule form for convenience, and while some users may want the powder version so they can take in their own measurements, Nootropics.com has carefully considered this for their capsules, so you can rest assured that you are getting the optimal dosage for the nootropic of your choice. Research and testing is done extensively for their products, including a quality assurance testing from Ceretropic. They also test for impurities and unwanted substances with FTIR to identify chemical bonds and HPLC to identify and quantify the components in the mixture. If you have doubts about the legitimacy of their products, you can check out their Certificate of Authenticity published on each product’s page. You can also find them altogether in the FAQ section together with the dates they were released. As previously mentioned, Nootropics.com only accepts Mastercard and Visa at the moment. They have commmitted to add other forms of payment like Bitcoin soon, but if you plan on ordering now, you may want to have those credit cards ready. You need not worry about getting your personal information stolen over the internet when you purchase from their site, though. Aside from offering a private connection via HTTPS, they are fully compliant with PCI Level 1 standards, a requirement for any website accepting and processing credit card payments. Don’t be surprised as well if you see a Chinese transaction on your credit card bill. Their payment processor is located in China under the name Baoxin E-Commerce Xiamen, but all transactions will be based on US dollars. Finally, Nootropics.com offers a 90-day no questions asked money-back guarantee which applies only if you are able to send back your order unopened. Although their return period is quite generous, they still lack a refund policy that accepts requests when packages are seized at the local customs department like (much like other nootropics suppliers, mind you). This is why it is imperative to give their shipping policy page a quick look, especially since they have a complete list of countries where they refuse to accept orders due to this scenario. Nevertheless, should your package experience this unfortunate scenario, you can get in touch with their support team and try to request for a re-ship or refund, and they will be more than happy to consider the circumstances and see what they can do for your situation. Perhaps you heard about nootropics from an officemate who used to struggle everyday in keeping him or herself awake during the daily grind, or maybe you learned about it from a friend who wants to be more focused in doing tasks. If you still have questions about nootropics and how it can boost your mental state, you can check out Nootropics.com’ article discussing the substance. Concepts are explained in layman’s terms so anyone can fully grasp the content. It also teaches readers tips on how to make the most from nootropics, as well as common misconceptions to clear any cloud of doubt. If you are curious about nootropics and would like to know more, this section will be able to answer pertinent questions about the substance, so you can go ahead and check it out. Nootropics.com has an impressive FAQ section that answers most things a buyer -especially first-timers- will ask prior to purchasing. Details about shipping, payment, store policies, and other important information can be found in this section, so it is advisable that you give it a quick read. If you want to contact their team, they have a Skype account that you can call, or you can simply send them an email. What's the Verdict on Nootropics.com? Nootropics.com may be a bit behind in terms of payment methods, since you cannot pay in any other form aside from MasterCard and Visa, but the store still is a pretty decent one. And like other nootropics stores, they technically don’t offer re-shipments or refunds if your goods are seized by customs. The good thing is they do review each case and extend a helping hand in order to offer the best solution to customers (which, interestingly, can sometimes get you a re-shipment or refund). Beyond that, unlike most nootropics suppliers that just throw a disorganized bunch of products in their page, they have a filtering tool to help you narrow down your options depending on the specific effect. Their products are served in capsules so you can take your dosage even when on the go, shipping is available internationally, and all transactions are secured and encrypted. Give yourself the gift of a better you, check out Nootropics.com now! Awesome review of this retailer! I actually haven’t checked these guys out yet… I’ll have to do so right after this 🙂 I get most of nootropics from places such as Absorb Health and PeakNootropics but definitely want to expand my search as the variety of products they offer are limited.